The Career and rise to stardom for the British born Ricky Gervais was not a walk in the park, it was a long drill filled with interesting twists. He is a stand-up comedian, actor, radio and show host, as well as a successful children books author. His career has seen him win some notable awards like the Brtish Academy Television Awards (2002, 2003 and 2004), Golden Globe Awards, and nominated for others like the Primetime Emmy Awards, Teen Choice Awards among others, for all his contributions in the entertainment circle. Ricky Dene Gervais is the 4th child of his parents born in the Battle Hospital, in the historical city of Reading, England on the 25th of June 1961 to French-Canadian father, Lawrence Raymond Jerry Gervais and an English mother Eva Sophia House. His father moved from Canada to the United Kingdom during the second world war, and he took on manual labors and hod carrying to earn a living. The family lived in a suburb of Reading, Whitley, England. Ricky has 2 elder brothers Larry, Robert born in 1945 and 1950 respectively and an older sister born in 1948. The young Ricky Gervais was educated in Whitley Park Infant and Junior Schools and later attended secondary school at Ashmead Comprehensive School. He worked briefly as a gardener in the University of Reading before he proceeded to the University College London, where he graduated with a degree in Philosophy though originally he had put biology as a course of study but would switch to Philosophy within 2 weeks. During his last year in UCL in 1983, he formed a duo pop music group with his friend Bill Macrae, Seona Dancing, they had 2 singles More to Lose and Bitter Heart under the London Record Label. One of the songs (More To Lose) did well in the Philippines but did not get any recognition in London. Afterward, he took an employment as the manager of the Music Rock band Suede till they gained commercial success and dominance in the 1990s. Ricky Gervais’s fascination with music did not end there, as he moved on, with yet another band in 2013. With his new band, they had songs like Equality Street, Free Love Freeway. He also produced several Youtube videos were he remade about 9 songs with an acoustic guitar under the caption, ‘Learn Guitar with David Brent’. By 2016 he had written about 15 songs which were published on the Life on Road Film Production with his names David Brent and Foregone Conclusion. The creative soul of Ricky Gervais later veered into radio show anchorage. He worked as an event manager for the University of London Union (ULU), from where he also worked briefly with Xfm while contributing to the radio program of Mary Anne Hobbs Radio 1. Gervais was put out of ULU radio when it was bought over by the Capital Radio group. He then went ahead and produced the debut series of a mockumentary sitcom titled The Office in 2001 before he made a return to Radio Xfm later that same year in November alongside his assistant Stephen Merchant. The talented media personality partnered with Karl Pilkington, an English Television presenter in producing several of Ricky Gervais Comedy Show Podcasts under the Guardian Unlimited Media Outfit, from December 2005 to May 2011. The podcast in 2006 clinched the No. 1 spot and made it to the Guinness book of records as the most downloaded podcast in 2007 amassing about 261, 670 downloads per episode. The 5 ft 7 inches tall comedian started his acting career in late 1998 with his debut in Comedy Lab assuming the character of Clive Meadows in 1999. The 20 episodes of the 11’OClock show brought him the much-needed fame in 2000 and from there on, he has hosted several television shows like the Golden Globe Awards (67th, 68th, 69th, and 73rd) and he has featured in television series such as The Simpsons (200, and 2011) among others. The renowned comedian has equally made several appearances in films like Dog Eat Dog (2001), Ghost Town (2008), Night At The Museum series (2009 and 2014), Muppet Most Wanted series and the list goes on. He is also an author of several children books such as the Flanimals book series from 2005. He has been on several world tours to promote his works and currently his works on Humanity is already streaming live on Netflix and the rights of his next work on SuperNature has been fully bought over by Netflix which means more money for the ‘foul-mouthed comedian’ as he is termed in the entertainment world. The entertainer is also a tireless supporter of humanist group movement as well as animal rights. The comic actor has been in the entertainment business for a long time now and he has done amazingly well for himself. His annual income is estimated to be about $80 million while there are various figures listed as his net worth, Celebrity Net worth pegs his Net worth within $110 million which could be more. He has also participated in several charitable endeavors one of such saw him donate about 5,000 British pounds to Macmillian Nurse, a health specialist that combat cancer issues. His one and the only girlfriend whom he has been associated with in over 3 decades is British born Jane Fallon. The duo met in 1982 in his varsity days. The humor maker, actor and producer is not married and does not believe in marriage as he says he does not believe in the existence of God. It seems that Jane Fallon is quite content with this decision as the duo has not been away from each other since 1982 when they met. 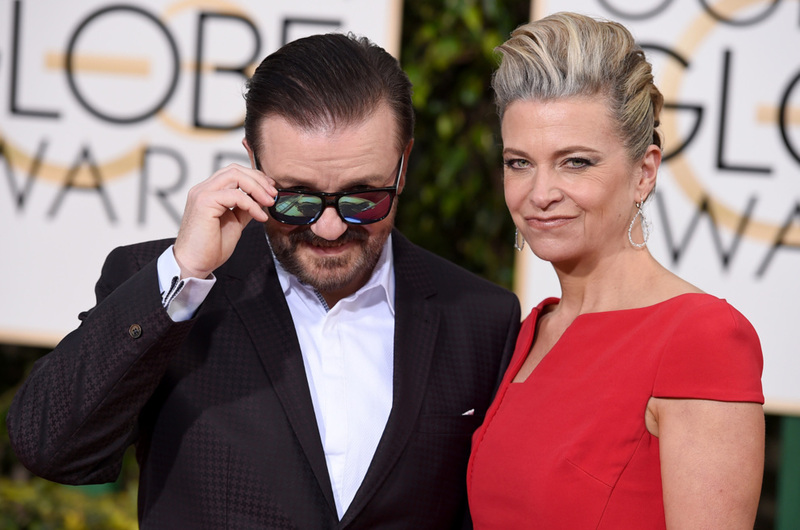 Ricky Gervais and Jane Fallon moved in together in 1984 sharing 2 beautiful houses in Hampstead (England) and New York. Jane Fallon is A television producer and the best selling author of about 8 books, she was born as the 5th child in Harrow, Middlesex, England on December 9th, 1960 to her British, newsagent shop owner parents. She studied history at the University College of London and she is an aunt to the actress Elise Fallon. Notable among the books authored by Jane are the FourSome published in 2010; nominated for the Melissa Nathan Award for Romantic Comedy Fiction in 2011, Getting Rid of Matthew was published in 2007, the novel also got named among the Nielsen Bookscan Fiction top 10. The Ugly Sister published in 2011 was not left out of the top rating as it was named No. 2 in 2011 and My Sweet Revenge in 2017. Some of her popular television production includes The EastEnders which ran from 1985 to 1994, Teachers (2001) and 20 Things To Do Before You Are 30 (2002), and the list goes on. Her cumulative net-worth is estimated to be $1.2 million which is not so bad an amount considering she still has her other projects upcoming, we know that amount will see more increase in the future.